Land Rover Managing Director Phil Popham: "I am optimistic we will sell more cars in the U.S. this year than we did last year. I'm confident we will do the same in western Europe." 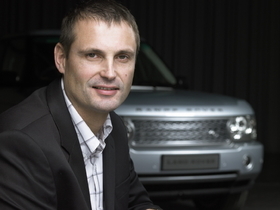 Land Rover Managing Director Phil Popham expects the British premium SUV maker to have a strong 2010 because of rising sales in Europe and the United States following a disastrous 2009. After two months, Land Rover's European sales are up 27 percent to 7,783 units while its U.S. volume has risen 11 percent to 3,990 units. The sales surge is being led by demand for updated versions of the Discovery (known as the LR3 in the United States) and Range Rover Sport. Both models were launched in 2009. Popham also expects Land Rover to see long-term benefits from the recent addition of former General Motors Europe President Carl-Peter Forster as CEO of Jaguar Land Rover parent Tata Motors Ltd. and former BMW AG and Ford Motor Co. executive Ralf Speth as JLR CEO. The 44-year-old executive shared his thoughts on these and other subjects during an interview earlier this month with Automotive News Europe Correspondent Douglas A. Bolduc and Automotive News reporters Diana T. Kurylko and Mark Rechtin. How will 2010 be for Land Rover? Last year was a particularly difficult year for the premium segment around the world. We were about 25 percent down in sales last year but in the fourth quarter we were up 23 percent and that momentum has continued in January and February. At worst, we have predictability across our markets. And the new products we introduced last year I think we are riding ahead of the recovery. I am optimistic we will sell more cars in the US this year than we did last year. I'm confident we will do the same in western Europe. When will overall global car sales rebound? I don't think we are going to see a worldwide recovery in 2010. We probably won't see a full recovery in 2011. It's probably going to be 2012 before we see the trends we saw back in 2007 around the world. How many sales have you gained from scrapping incentives offered in Europe? We may have sold 800 to 1,000 units associated directly with the scrapping incentives. That is not a huge number. But when there was a lot of talk about scrappage being introduced, I said anything that got people focused on buying cars again was good for the industry. We benefited indirectly. As the recession started to really dig down deeply people just stopped buying cars. Nothing was on their shopping lists. What the scrapping schemes did was get people to keep thinking about buying cars. I think that was great for the entire industry even though the premium segment did not benefit directly from the incentives. What do Carl-Peter Forster and Ralf Speth bring to JLR? (Carl-Peter Forster) has a history with Land Rover. Many of us know him, and Dr. Ralf Speth as well, who was very closely connected with Land Rover in the past through BMW. They are car people. They understand cars. They understand the auto industry and I think they are going to be instrumental in helping us fulfill the ambitions that we have. How would you describe Land Rover's relationship with Tata Motors compared with former owner Ford Motor Co? I would describe Tata as a nurturing parent. They bought us in June 2008, which was basically right at the start of the recession. That created some challenges while transitioning out of Ford. Tata is a huge company but a different company from Ford. Ford was a very big automotive company in which we were a part - we were undoubtedly a net beneficiary from Ford ownership in terms of processes such as manufacturing quality and engineering. We are now part of an equally large company in Tata, but they are a multinational conglomerate. And their approach is to run their businesses as separate organizations and separate entities in a supporting rather than a controlling way. As an independent company, which is the way we are run, the decision stops with us and I fully expect us to be able to exploit that benefit of being reactive and nimble both is market conditions and to trends to look for opportunities and exploit those opportunities in a market, hopefully in the next two to three years that is going to be more robust and more buoyant than it has been since Tata bought us. Where is Land Rover headed next? Although we have aspirations to sell 200,000 to 300,000 vehicles and up to 400,000 to 500,000 for Jaguar Land Rover, we are still a small company in automotive terms and we have to have a real focus on cost and efficiency. Our history is not particularly efficient in terms of the number of platforms we have for the number of nameplates and product lines we have. So clearly we need to be more efficient in terms of our use of platforms and architectures in the future. While we have no specific plan to share platforms between Jaguar and Land Rover we are certain to share architectures and components to get the biggest bang for our buck in terms of our investment. How will you lower the CO2 emission of your lineup? Next we will introduce the compact Land Rover based on the LRX concept. Also, when we replace the Range Rover and Range Rover Sport, they will be significantly lighter than they are today to allow us the flexibility to put in a smaller powertrain and get the real benefits of fuel efficiency and lower emissions. We will have full hybrids in the future, but it is expensive to put in the car and there are some people who will pay for that technology and many who won't - that means they (hybrids) won't be the only solution. The key focus is to take out weight to help improve fuel efficiency.